The Grapevine this week covers every age group Juniors, U23, World Games and Masters! We have had ECBU and still have players out in Toronto and Cali for U23 and World Games (helpful page coming soon) the Juniors have the European Youth Ultimate Championships coming up, schedule and pools is out! …and the first days of World Games in Cali. The Opening ceremony was last night and Ultimate games start on Sunday. The TD’s have arranged this amazing score reporter called WING, which will show game time, time outs, goals, assists, Ds, drops, pulls and touches during the game or during the tournament; also a fresh new tool which draws the disc trajectory. For more details check out the Grapevine WG special tomorrow. Our coverage of ECBU is now done and Chrissy Birtwistle from the Womens team has written another piece for Forbes on failure leading to success. 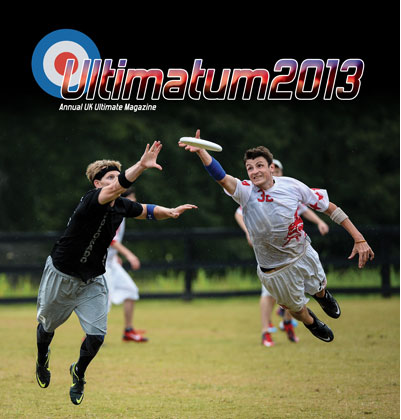 After a small hiatus Ultimate Interviews returns with a chat to the Ultimate field marker Martin Rasp. UTalkRaw is on holiday for a bit so contact Barry if you have any ideas for new shows but Understanding Ultimate is not and discusses hard work, talent and Ben Wiggins. xEUCF is not that far away and all the regional allocations have been decided and two Masters teams have already been accepted! Who will go from Open, Women’s and Mixed teams? Regionals next weekend then Nationals over Bank Holiday to decide! Busy times! Keep supporting the U23’s with #u23wfdf and following their twitter accounts. Full ECBU 2013 results can be found here with a lot more on the live.ecbu2013.org website! Huge congratulations go out to all who represented Great Britain and thanks to every supporter out there or back in blighty! Watch out for our insiders review in next few weeks…. Ragnarok are representing Europe at the US Open in Raleigh, North Carolina. Started play yesterday but Get Horizontal have brought together all the info you need to follow them! Love to jack it deep? See what Benji has to say about hucking on Understanding Ultimate. UTalkRaw is really starting to bring in the ultimate celebrities, check out episode 26 where Dan Roddick tells us about the beginnings of Ultimate itself! A cool analysis blog, Ultimate Strategy and Coaching has recently started looking into NexGen games with the aide of the match footage. Find it here! Last but not least, EMO have been doing a great job on pitch and with their social media. Like their FB page where you will find not only their team lists for the upcoming #ukut3 but read the piece from Ian ‘Scot’ Scotland – EMO’s mentality change in 2013. EMO having their best season so far in 2013. Enjoy the sun and Wimbledon semis and finals! More to come soon! DP @ tSG. Well loved ultimate writer Lou Burruss returns to contributing for SkyD to the joy of Frisbee nerds worldwide. Check his post out for various assessments of the US scene so far this year, as well as hints at future articles set to tackle the status of the various professional leagues, and the status of women’s ultimate. ECBU is well under way, with GB making a strong start in all divisions. 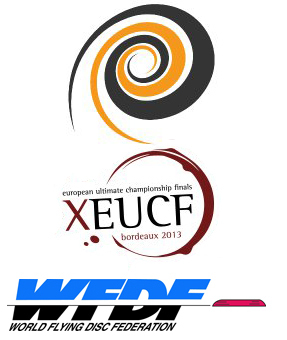 Check out live.ecbu2013.com for streaming and results, as well as Skyd’s Tournament Central for in-depth coverage. Smatt’s latest post shows the madness of Tour 2 from Kapow’s perspective.